Lori Lynn, over on the Crafty Secrets member forum, challenged us to create a project using our favorite CS products. 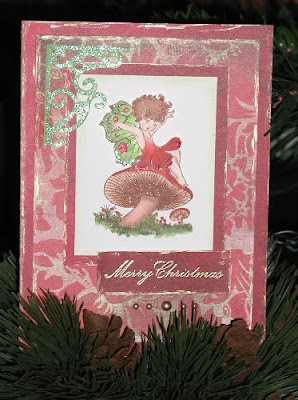 I used two of my favorite stamps, the fairy and mushroom, from Crafty Secrets' Fairyland set. I've dressed up this sweet fairy for St. Patrick's Day and for autumn and thought I'd get her ready for Christmas too! I love this sweet fairy card, Marcy! Thanks for the visit! Sandy didn't ask me to do this till yesterday--and I was gone most of the day! Felt bad cuz I didn't even get started on it till about 11:30pm! Not as good as I'd like it to be, but I was SOOOOO tired! The chips are so yummy like this! They don't stick to the pan--I spray it first--but you do have to make sure you get the spatula underneath them or they'll stay put--you have to try it--can't even tell you how great it is! Hope you're having a great day, Marcy! See you over at SCS! Hey Marcy! How are you? This is such a creative card and I really like the color you chose! PERFECT! Can't wait to see what you come up with this week! Take care ... see you on the forum!! Oh yea ... LOVE your new blog background!! Looks so "homey"! Good job! Thanks for the visit, Marcy! You're always so sweet to me! You just reminded me...I've gotta get in gear and make my tag for SCS! This has been a nutty couple of weeks--got to remember what's most important...stamping, of course! Hope you're staying cozy over there in Pennsylvania, dear friend! And yes...those cookies are definitely worth adding a few calories to your day! Much love to you!